We are very excited to announce a preview of report theming, which will allow you to quickly color your entire report to match a theme or corporate branding. When you import a theme, all your charts will automatically update to use the theme colors, and you’ll have access to the theme colors from the color palette. You can upload a theme file using the Import Theme option under the Switch Theme button. 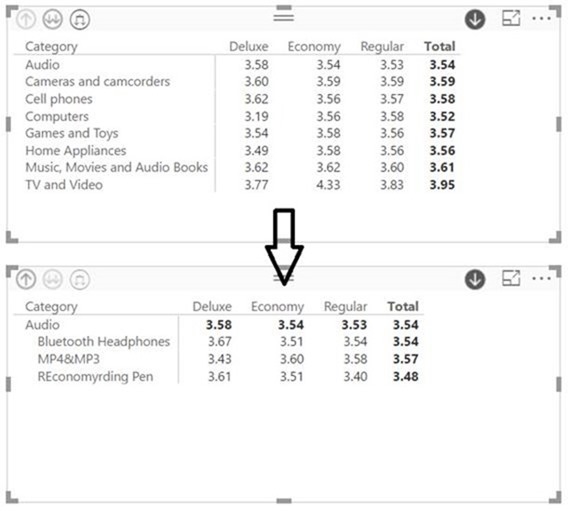 background, foreground, and tableAccent – Colors to use in table and matrix styles, how they are used depends on the specific table/matrix style applied. Tables and matrices by default have no style applied, so you will not see any theme colors until you apply a style. When the theme is uploaded, the colors will automatically be applied to all charts. You’ll also see the colors in the color palette, so you will be able to use them in other places as well. 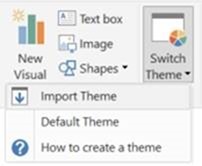 Applied theme colors will follow your reports when you publish them to Power BI on the web, and you can choose when pinning a visual to a dashboard if you want the theme to be carried forward. If a data point has a custom color set, applying a theme will not override your custom color. 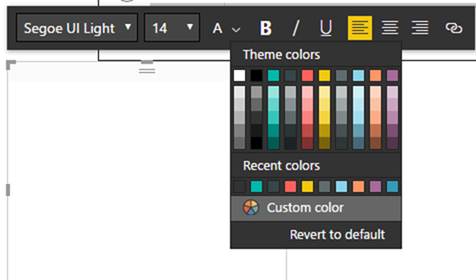 Additionally, during the preview, if you have manually set a data point’s color through the Theme colors section of the color palette, those colors will not be updated when you apply a new theme. If you would like the theme colors to be applied in this case, you can use the Revert to Default option for either the either Data Colors card in the formatting pane or for a given data point color. We will be improving this experience during the preview. You can turn the theming preview on by selecting Custom Report Themes under File > Options and settings > Options > Preview features. This is just the first preview of theming, so be sure to give us feedback on what you’d like us to add next. We have plans to both expand what can be themed in a report and allow theme creation within the Desktop itself in later updates. Stay tuned for all these exciting updates! If you are looking for some examples to get started, you can download the theme I used in this example, a theme that is more color blind user friendly than our default, or if you are feeling nostalgic, a zip file of all the Power View themes. 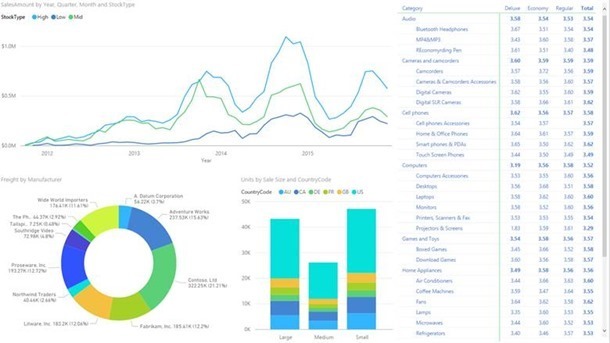 You can find other themes or submit your own theme on our report theme gallery in the Power BI Community. You can also read our documentation to learn more. As hinted at in previous releases, we’ve been working on some updates to our matrix visual, and we are very excited to share these with you as a preview of a new matrix visual. We are previewing this new version of the matrix as a separate visual, so you’ll be able to test out the new experiences without impacting any of your production reports. 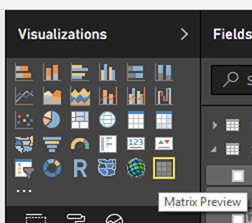 Once you turn on the preview by selecting New matrix visual under File > Options and settings > Options > Preview features, you will see the new matrix in the visualization pane. In the new matrix, when you create a hierarchy you will see only the top level by default and can drill into lower levels. You can drill into the row headers using the drill buttons in the visual menu or use the right click menu. While, using the Expand all down one level in the hierarchy button will show multiple row header levels at once. You can also turn on Drill Down and drill into one specific row header. As mentioned, you can also use the right click menu to do all these drill actions on both row and column headers. Under Row headers in the formatting pane, you can turn Stepped layout off to get a similar style to our current matrix. You can also control how big of an indentation you want in the stepped layout. You can also cross-highlight by clicking on an individual cell or any row or column header. You can learn more in our next matrix documentation. We’ve added the ability to change font color of your text in textboxes. Highlight the text you want to color and select the color you want through the color palette. This month, we are adding a preview of a new type of slicer, the numeric range slicer. You can use this slicer type with any numeric column in your data model. You can choose to filter your data between two values, less than or equal to a value, or greater than or equal to a value. The slicer will filter the data behind your charts based on range you select. Currently the slicer always filters every underlying row in the data, not any aggregated value. 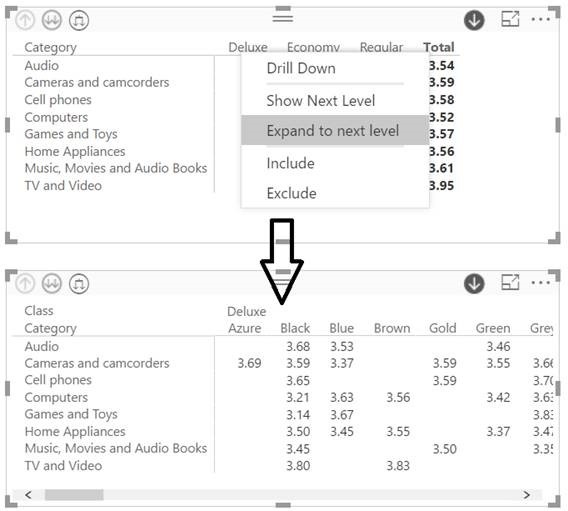 For example, if you used a ‘Sales Amount’ field, it would filter each transaction based on its Sales Amount, not the sum of Sales Amount for each data point in a visual. The slicer does not yet work with measures, but we’re going to add this in future. 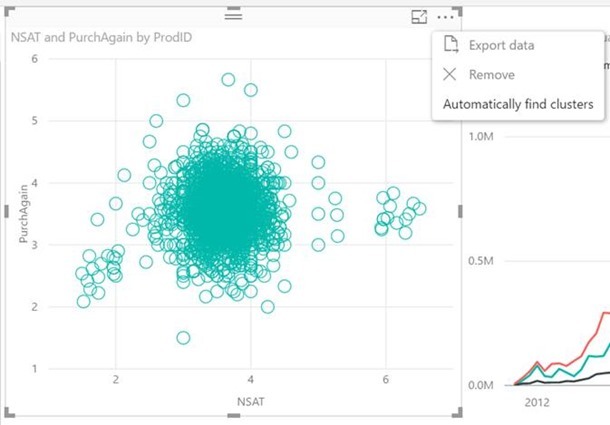 At the moment the preview is only available in Power BI Desktop. 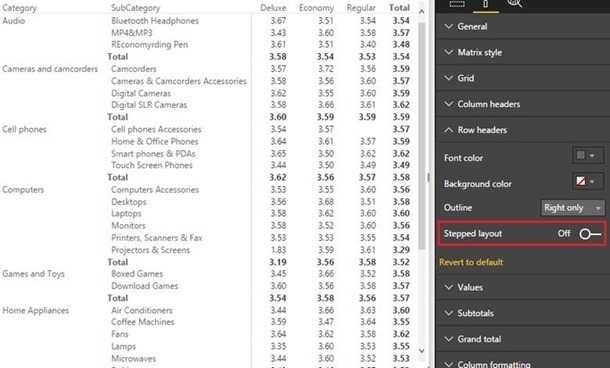 If you publish a report with this slicer to the Power BI service it'll display as a list slicer, although the filter will still be applied. We'll add support on the service in a future release. You can turn the preview by checking Numeric range slicer under File > Options and settings > Options > Preview features. You can learn more in our numeric range slicer documentation. 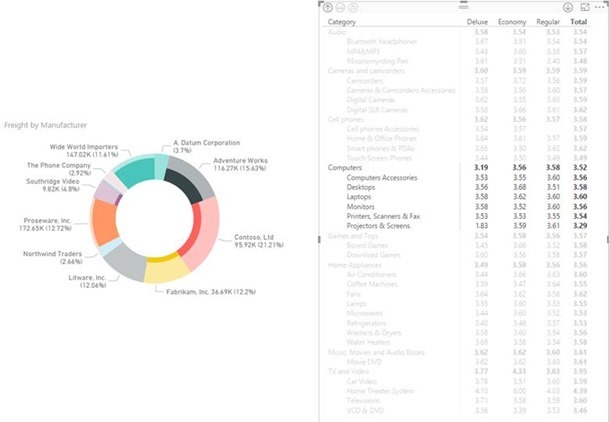 We’ve added percent of total as another data label option for pie and donut charts. 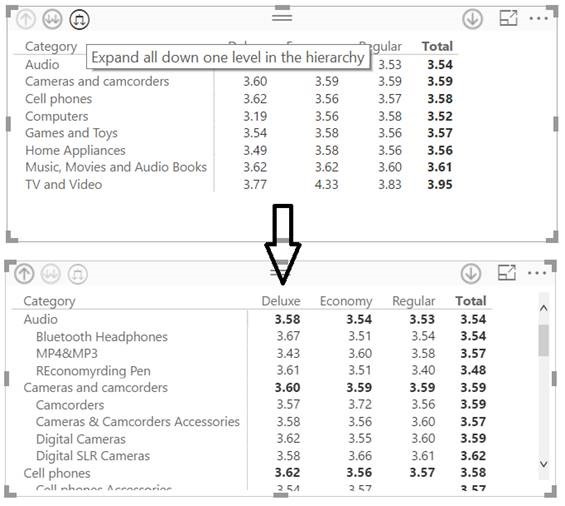 You can now select from any combination of data value, percent of total, and category for your data label. You can find this setting under Label style in the Detail labels card of the formatting pane. Starting this release, you can now multi-select multiple series in a chart when cross-highlighting. This means you can do more complex analysis and comparisons. For example, I could select my top 3 sale sizes split by brands to learn more about my largest sellers. Back in November, we released a preview of clustering. With this release, we are now making this feature generally available, so everyone can now take advantage of this great feature. 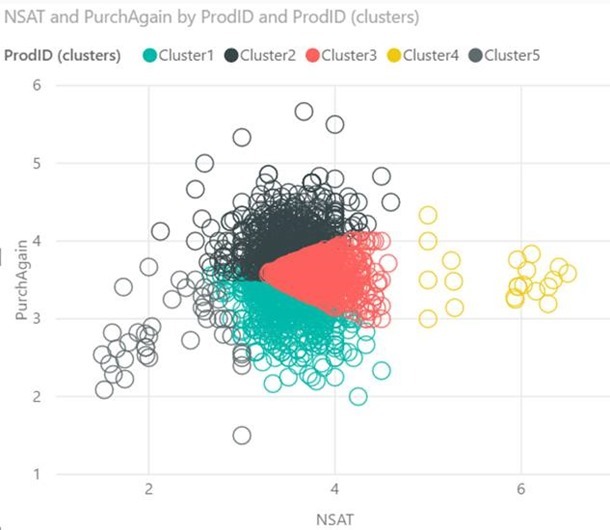 You can find clustering by selecting Automatically find clusters from the visual’s More Options menu on scatter charts and tables. We will generate clusters based on your setting and create a new field in the field list with clusters we’ve found. 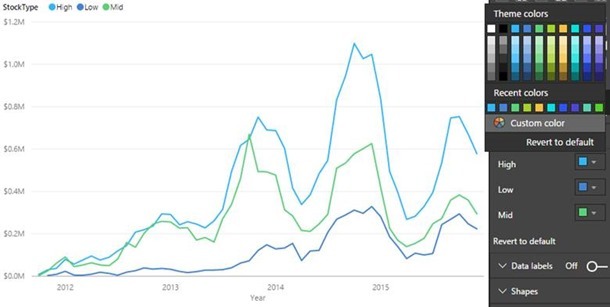 This month we’re adding a new connector to allow you to import data or connect live to your Analysis Services instances running on Azure. 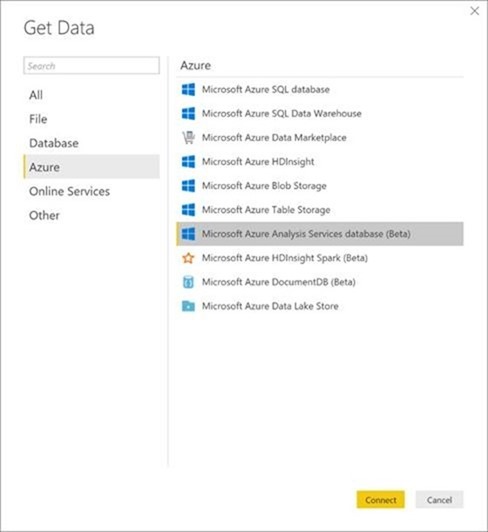 The new Azure Analysis Services connector can be found under the Azure category in the Get Data dialog. 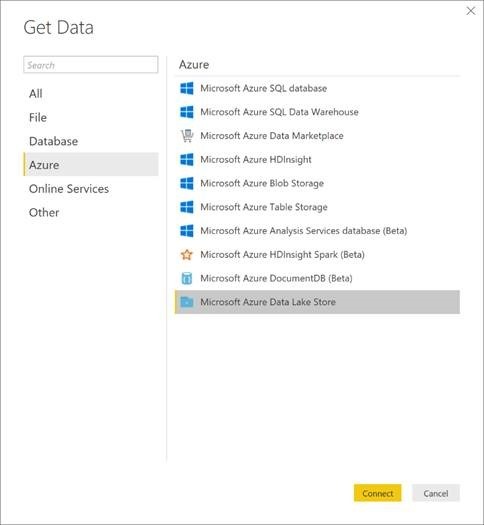 The Azure Data Lake Store connector, which was released as a beta in 2016, is now generally available. The connector can be found under the Azure category in the Get Data dialog. The DB2 connector dialog now exposes a new option to specify the package collection to connect to, within a given DB2 server. This new option is available under the “Advanced Options” section in the DB2 connector dialog. 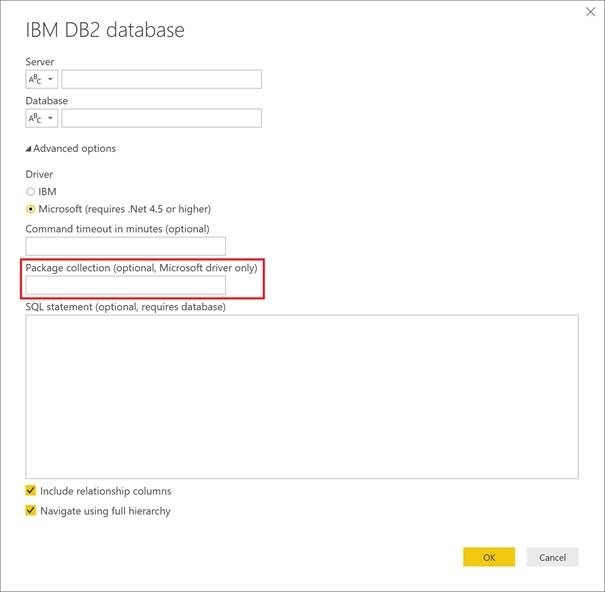 Note that this option can only be used with the Microsoft IBM DB2 driver. This month we continue making incremental enhancements to the Combine binaries feature. 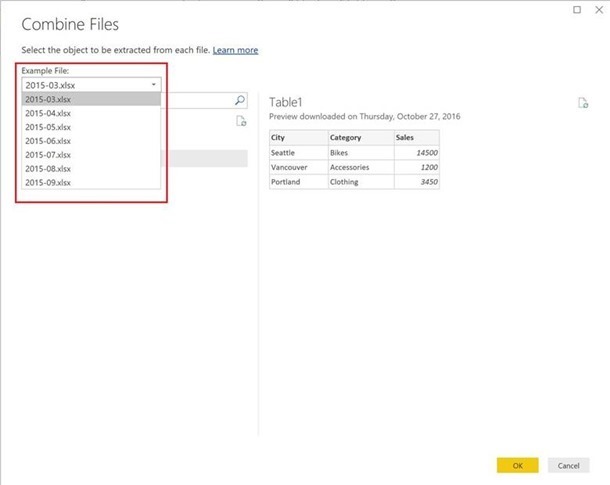 One of the common areas of feedback recently has been having the ability to select which file from a folder should be used as the sample file to select objects and specify any custom transformation steps (if needed). With this release, we’re exposing a new control in the file preview dialog to select one of the files available in the selected folder. Default selection is the first file found, but this can now be easily customized by you. 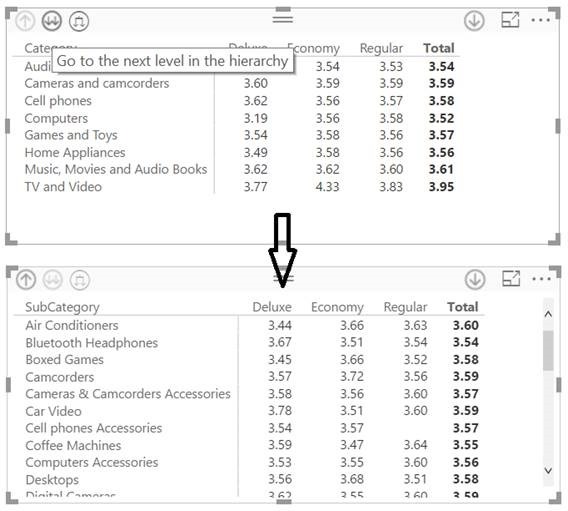 When creating a new Split Column By Delimiter step, Power BI Desktop will automatically detect and populate the delimiter field in this dialog based on text pattern detection in the data preview rows. Note that you can still change the delimiter if needed, but this automatic detection should help you save a few clicks in many cases. That’s all for this month! We hope that you enjoy this new update and continue sending us valuable feedback about our product. Please don’t forget to vote for other features that you would like to see in the Power BI Desktop in the future. Inscrivez-vous ci-dessous pour recevoir les dernières informations concernant Power BI, directement dans votre boîte de messagerie ! 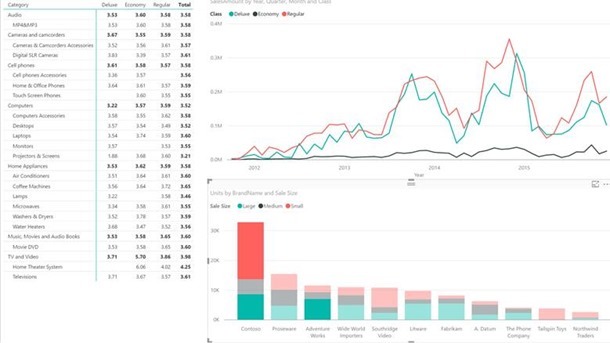 En cliquant sur S’inscrire maintenant, vous donnez à Microsoft votre accord pour recevoir la newsletter Power BI qui offre en exclusivité des nouveautés, des enquêtes, des astuces et des conseils, ainsi que d’autres informations pour tirer le meilleur parti de Power BI. Vous pouvez vous désabonner à tout moment. Déclaration de confidentialité Microsoft.